This past year my school did something a little different with our book study. Instead of a book geared toward educators, we "read" StrengthsFinder 2.0 by Tom Rath (affiliate link). I put "read" in parenthesis because this is not a book you read from cover to cover. Instead, you read the introduction and then take an online quiz (that you only have access to using a scratch-off code inside your copy of the book). After taking the online quiz, which consists of questions with a "range" on how you feel about various topics/scenarios rather than right or wrong answers, you are given your top 5 (of 34) strengths. I must say that they were spot on and the detailed descriptions of each of my top 5 strengths described me to a tee! It's interesting to think about actually taking each person's strengths in a workplace and building on it. Letting those people do the things that make them shine! At first, I was a little disappointed in my results as I figured "achiever" would be my number one strength - that's always been my personality. However, it was number two. My number one strength was....DELIBERATE. Hmmmm....I wasn't happy with that word. It seemed to have a negative connotation to it. Then, I read the description for this strength and it was an AHA moment. I am deliberate. In everything I do. In throwing parties, in planning vacations, in planning my week, and in running my classroom. It all made sense. I'm a planner. Rarely do I do anything without having thought through it beforehand. I have a backup plan for my backup plan. Anyone else? 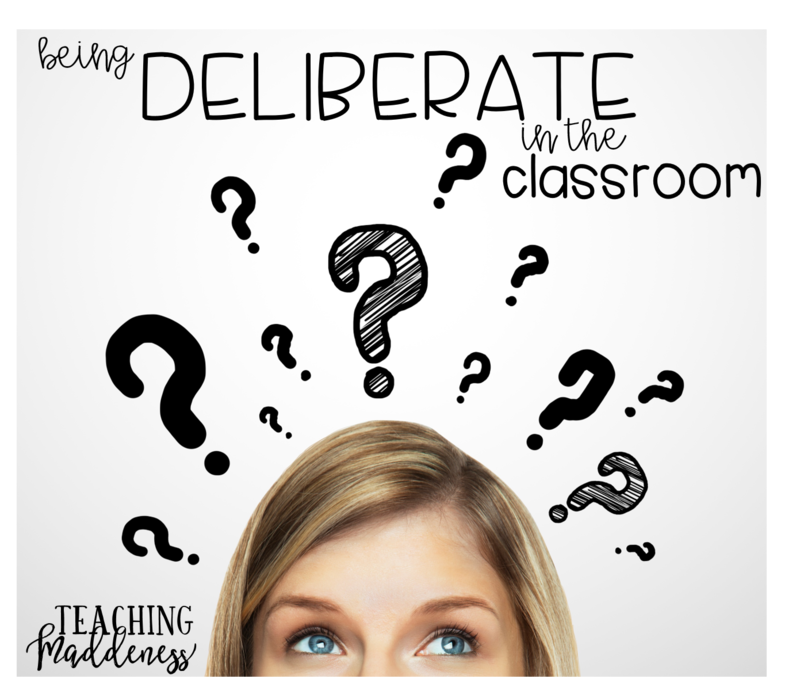 Being deliberate is SO important in teaching. I've always been told classroom management has been one of my biggest strengths....this is why. My classroom runs SMOOTHLY. I have a system for everything. I sometimes watch other teachers take their students to the hall restroom, go out to fire drills, or monitor their students at lunch or on field trips and think WHY? Why don't they have a system in place? Things just run much smoother with a system that has been deliberately planned ahead of time. I hope that if DELIBERATE is not one of your top strengths, you'll pick up a tip or two that may help you start thinking and planning ahead for the new school year. If you've taken the strengthsfinder quiz before, what was your top strength? Be sure to share it with others and use your strength to help them! Thank you - excited to read these posts!